The recent visit to Hong Kong was more than a vacation or an eating expedition. To us both, it meant a lot more, almost like a dream come true for it was my first visit to tmcy's homeland since we first got attached almost 3.5 years ago. Many events unfolded along the way which led to this much delayed visit, but as the saying goes, better late than never! Upon returning to UK, we were pretty amazed at the amount of food we had tried in HK over the span of 12 days. All thanks to darling who bought a guide book and did tons of research online for best eats did we manage to try the fine culinary skills of authentic Cantonese cuisines and other local delicacies alike. We had shortlisted a selected bunch of eateries or restaurants worthy of our calories and definitely worth a second visit and will be publishing the reviews over the weeks to come. For returning visitors, do accept our apologies for the slow updates for it is the time of the academic year where all students loathe, EXAMINATIONS! It took us a while to figure out where Yung Kee was for the signboard was replaced with the above banner, which translates to 'Unscrupulous property owners forcing a move'. 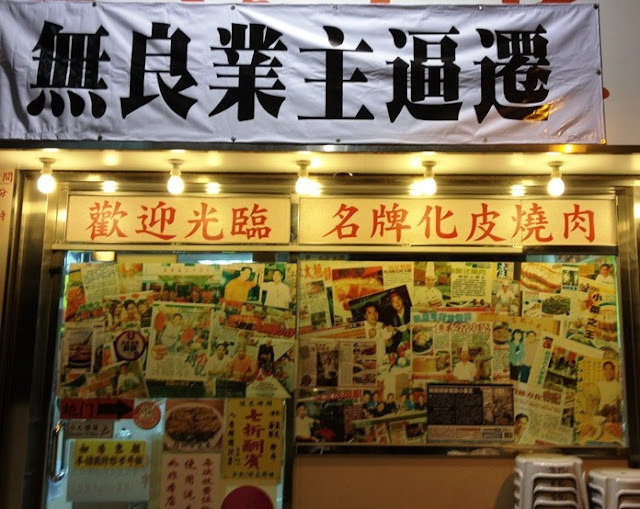 With property prices on the rise in HK, it would be a real shame if this fine eatery tucked in Sham Shui Po gets forced to move eventually..
Plastered with photographs of visiting celebrities and even the Chief Executive of Hong Kong, it was no wonder that the restaurant was packed full of diners even at 9.15pm. Coincidentally, we realised that there was a 30% discount on the bill for diners that visit after 9pm and beers (Asahi and Carlsberg) were at a promotional price of HKD10/bottle, which equated to about S$1.50! Spoilt for choice, we decided to consult the serving uncle for recommendations, only to be rebutted with 'Everything here is nice la!'. Right, obviously that did not help us much, so we went for the few top dishes recommended in the guide book! This was their signature dish and definitely a MUST-TRY. (+) One of the best roast meat I had in my life. (+) Distinct layers with perfect proportions of crispy skin, fat and thick portions of lean meat. (+) Every bite gives an ooze of the juicy fats, coupled with crispy crunchy skin that crackles. (+) The lean meat at the bottom layer gave a very well balanced and complete feel to the delicacy. (+) Unique wasabi and soy sauce condiments, though the latter tasted very much like 'hoi sin' sauce. (+) All sauces used resembled a blend of various condiments, providing that unique difference. (-) Unlike the Singapore/Malaysian style of eating, no chili sauce was provided as accompanying condiment. (-) Each portion of the roast meat was a thick cut and chunk. 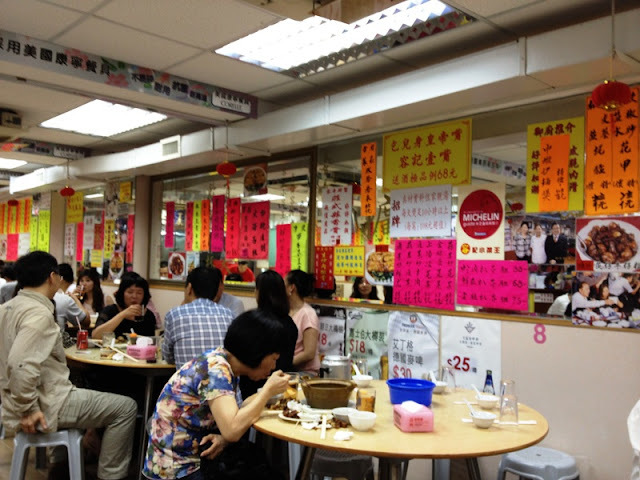 (-) Price seemed slightly steep at HKD128 for the above serving, approximately S$20/-. 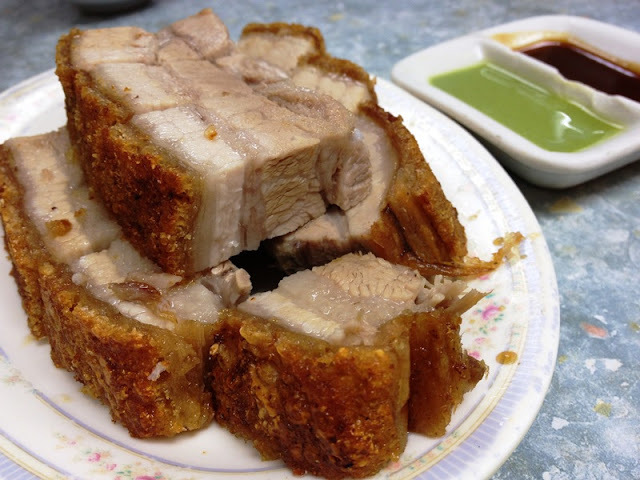 生炒骨 is a variation of the usual 咕噜肉, with the former using spare ribs while the latter uses shoulder meat. Did not seem all that different to me since both were cooked in the same style, sweet and sour. 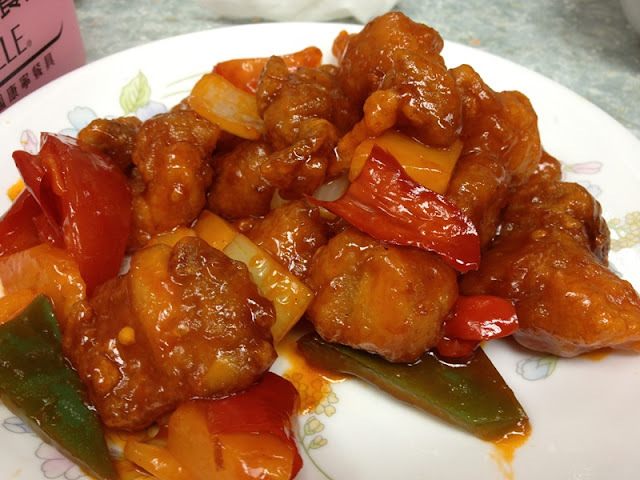 (+) The sweet and sour sauce was of a prime balance in terms of flavours. (+) The spare ribs omitted an ooze of juiciness upon each bite, though all bones were removed. (-) The fried batter was simply not crispy enough, and this was not owed to the soaking gravy. This was certainly one of the most divine dishes tried on my entire HK trip, particularly cos of my fondness for geoduck. It was my first time trying geoduck cooked in a typical Cantonese stir-fried style as opposed to the usual sashimi or dipped in tonic soup. 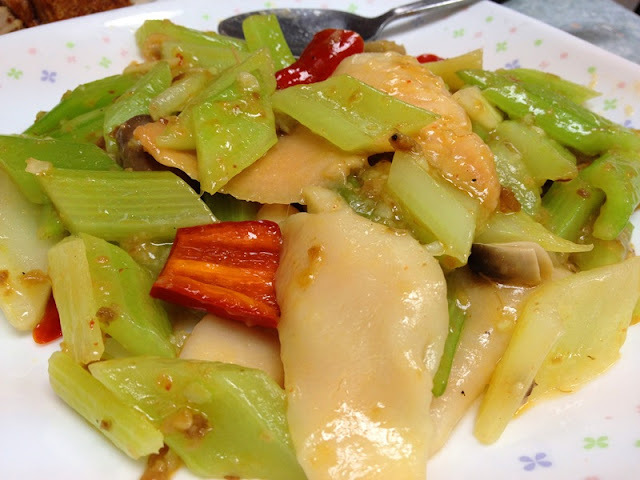 (+) The geoduck was cooked to perfection, maintaining a slight chewiness and did not taste too 'elastic'. (+) A tinge of spiciness from the red peppers with fragrance from the minced dried peeled shrimps. (+) The celery added a good crunch and varied mouthfeel, with a slight fresh sweetness. (+) The gravy was perfect to go with the plain rice, and it was so good that we had to order an extra bowl! (-) Might be a bit too spicy for people who cannot take the heat, otherwise it is definitely a MUST-TRY. This is not the usual Singapore/Malaysian kind of fried prawn cakes, which typically has a few prawns on the surface. This version has is in fact surimi-based, though you could taste the minced prawn meat and to a certain extent, octopus meat as well. 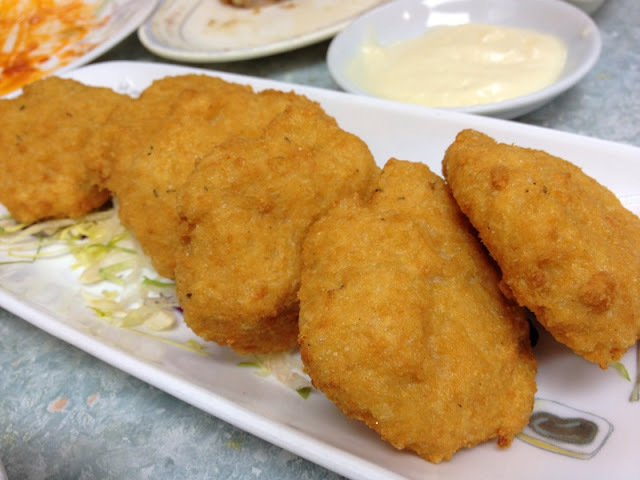 (+) Extremely crispy on the outside and the soft, bouncy-textured surimi on the inside was a great contrast. (+) The surimi did not taste or smell overwhelmingly strong of the typical oppressive 'fishy' smell. (+) Surimi inside was not the typical soft, 'lumpy' type, but rather firm and bouncy, like a good fishball! (+) The mayonnaise provided was an unique blend, leaving a slight aftertaste of sweetness. (+) Thankfully, being the final dish, it was not too greasy at all. (-) If you are after a purely 'prawn-based' cake, then you might be slightly disappointed for the 'prawn flavour' was not distinctly strong. We only knew about the 30% discount when we asked for the bill, and surprisingly, the meal was very affordable! For the four dishes above, coupled with 2 bowls of rice and 2 large bottles of Asahi, the overall bill came to just shy of HKD300! (approximately S$48) It was definitely a steal considering the quality of the food. Even at the original price, it was still worthy of every penny. Unlike most eateries in HK, Yung Kee specially imports their serving cutlery, which has an anti-bacterial coating and not prong to breaking easily. Therefore you can be assured of eating safe and clean, unlike being served those chipped plates and bowls. Yung Kee is easily accessible via the MTR, exiting at Sham Shui Po station, B2 exit, and you will land at Fuk Wa Street. Do take extra heed when trying to locate the eatery for it is masked by the street vendors. 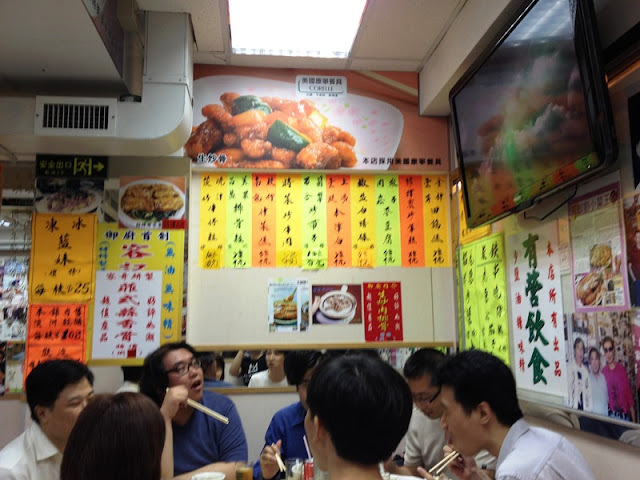 It is about the only eatery located along the stretch of eateries that has celebrities and accolades plastered all over the shopfront. If I were to visit HK again, Yung Kee would certainly be on my MUST-TRY-AGAIN list!